Where were a few settings changes suggested by Xcode 6 that required some project tweaks. Instead of always using the default blue color for cursors and selection areas, on iOS 7 and above the component now obeys the tint color. 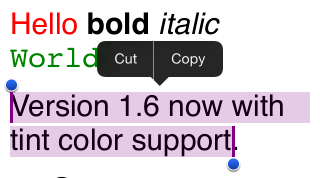 This allows you to customize the editor view to match your tint color requirements. The update is tagged on the private repository and also released via the private Cocoapods specs repository.